preventive occupant protection system. There is a choice of four and six-cylinder engines with up to 13 percent more output than the preceding model, accompanied by up an to six percent lower fuel consumption. With a length of 4581 millimetres, the Saloon is 55 millimetres longer than its predecessor. The body width has increased by 42 mm to 1770 millimetres, and the wheelbase by 45 mm to 2760 millimetres. These dimensions create the conditions for a generously sized interior, and therefore more comfort. The front shoulder room has increased by 40 millimetres, for example. The design of the new C-Class is based on the modern Mercedes idiom, which reflects the technical superiority of automobiles bearing the star with taut lines and large, tranquil surfaces. The pronounced wedge-shape of the front end serves to emphasise attributes such as agility and performance. For the first time in a Mercedes salon, the radiator grille is used as a distinguishing feature to position the model variants more clearly. Three extended, horizontal louvres and a big centrally positioned Mercedes star characterise the AVANTGARDE model as a traditional design feature of sporty Mercedes models. Together with the sporty, high-quality appointments, this feature emphasises the youthful, agile appearance of this C-Class. This sporty presence can be enhanced even further with the AMG sports package, which includes striking front and rear aprons plus side skirts. In the ELEGANCE model Mercedes-Benz employs a three-dimensional, louvred radiator grille with a high-gloss paint finish to accentuate other brand-typical attributes such as comfort and luxury. The CLASSIC model in the new C-Class is intentionally more restrained and traditional, but offers the same technical innovations as the other two model variants. This "product-in-product" concept enables Mercedes customers to accentuate individual choices, and configure the C-Class to suit their personal taste and lifestyle even more emphatically than before. All the models offer the same, extraordinary driving experience that the Saloon provides by virtue of further technical improvements. Both by its outstanding long-distance comfort and its dynamic handling, the C-Class sets new standards in this market segment. AGILITY CONTROL - this is the term used by Mercedes-Benz for all new and further developments that improve both comfort and agility in equal measure. This standard package includes the AGILITY CONTROL suspension, which controls the shock absorber forces according to the driving situation: when driving normally with low shock absorber impulses, the damping forces are automatically reduced for a noticeable improvement in ride comfort - but without any compromise in handling safety. When driving more dynamically, the maximum damping forces are set and the car is effectively stabilised. The AGILITY CONTROL steering of the new C-Class has a ratio of 14.5, and is therefore six percent more direct than the steering of the preceding model. The likewise included AGILITY CONTROL gearshift reflects the sporty character of the C-Class with a short travel and precise shifts. Mercedes-Benz has also developed the ADVANCED AGILITY package with a sporty driving mode, which will become optionally available from autumn 2007. This offers the driver a choice of two gearshift programmes: Sport and Comfort. Within these programmes the shock absorber for each wheel has infinitely variable electronic control. A newly developed speed-sensitive steering with a more direct ratio, variable centring and adaptation of the accelerator characteristics and automatic transmission shift points is also included in the package. ADAPTIVE BRAKE is another new development in the area of running gear technology. This is based on the technology of the S-Class and provides additional support functions for even more safety and comfort. Examples include Start-Off Assist for uphill gradients, priming the braking system in critical situations and light contact to dry the brake discs in wet conditions. With a remarkable boost in output by up to 13 percent and an increase of around 18 percent in torque, the engines also do more than their bit to create the lively nature of the new C-Class. The four and six-cylinder units not only excel with powerful responsiveness, but also contribute to the excellent ride comfort of the Saloon with their improved smoothness. 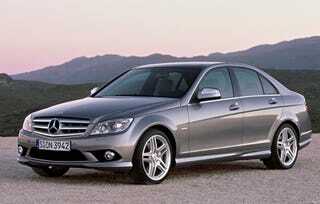 Mercedes-Benz has paid particular attention to further development of the four-cylinder engines. In the petrol range, the output of the entry-level C 180 KOMPRESSOR has increased from the previous 105 kW/143 hp to 115 kW/156 hp, with maximum torque improved by 4.5 percent from 220 to 230 newton metres, while the C 200 KOMPRESSOR develops 15 kW/20 hp more than before. It has an output of 135 kW/184 hp and generates its maximum torque of 250 newton metres from 2800 rpm. These modified engines considerably improve the performance and fuel consumption of the four-cylinder models. When accelerating from standstill to 100 km/h, the C 200 KOMPRESSOR is 0.5 seconds faster than its predecessor. Improvements in fuel consumption are equally impressive: the C 180 KOMPRESSOR consumes 0.3 litres per 100 kilometres less than before, while the combined fuel consumption of the C 200 KOMPRESSOR has been reduced by 0.5 litres per 100 kilometres. Further development of the four-cylinder units was also the main focus for the diesel engines. The engineers in Stuttgart have made further improvements to the engine, turbocharger and common-rail direct injection, modifying more than 90 components. As a result of these measures the new C 200 CDI has eleven percent more output than the preceding model, with 100 kW/136 hp versus the previous 90 kW/122 hp. The C 220 CDI develops a peak output of 125 kW/170 hp (previously 110 kW/150 hp), and generates a torque of 400 newton metres from 2000 rpm - around 18 percent more than before. Fuel consumption has been reduced by up to 0.3 litres per 100 kilometres: in the New European Driving Cycle (NEDC), the C 200 CDI and C 220 CDI are able to travel 100 kilometres on just 6.1 litres of fuel. The modern V6-engines in the C-Class range remain unchanged, with a choice of three petrol units developing 150 kW/204 hp, 170 kW/231 hp and 200 kW/272 hp. The six-cylinder of the new C 320 CDI has an output of 165 kW/224 hp. With the exception of the C 350, all models in the new C-Class are equipped with a six-speed transmission featuring AGILITY CONTROL gearshift as standard. The top-of-the-range C 350 has 7G-TRONIC, the world's only seven-speed automatic transmission, as standard equipment. This is also available for the other six-cylinder C-Class models on request. During the course of its development, the new C-Class successfully passed more than 100 crash tests, including the particularly demanding, in-house impact tests of which some go well beyond the legal requirements. Passing these is a precondition for the highest accolade in automobile safety: the Mercedes star. Occupant protection is based on an intelligently designed bodyshell, 70 percent of which consists of high-strength and ultra high-strength steel. Compared to the previous series, Mercedes-Benz has enlarged the deformation zones even further and improved energy flows. The front-end structure of the new C-Class has four independently acting impact levels, which enable forces to be distributed over a wide area while bypassing the passenger cell. The safety technology in the interior has been complemented with the very latest protection systems. Seven airbags are included as standard equipment: two adaptive airbags for the driver and front passenger, a kneebag for the driver, two sidebags in the front seat backrests and two large windowbags which extend from the A to the C-pillar during a side impact. The driver, front passenger and the passengers on the outer rear seats also benefit from belt tensioners and belt force limiters as standard. The standard head restraints operate on the NECK PRO principle: during a rear-end collision the padded surfaces are pushed forward within milliseconds to support the heads of the driver and front passenger at an early stage. This significantly reduces the risk of a whiplash injury. Mercedes-Benz has developed flashing brake lights as a major help in reducing rear-end collisions, and these are also standard equipment in the new C-Class. If the driver needs to brake hard at speeds in excess of 50 km/h, the brake lights flash rapidly to warn drivers following behind. activates certain systems as a precaution to prepare the vehicle and its occupants for an impending accident. Accordingly the passive safety phase does not begin when the impact has already occurred, but before an impending collision. The Intelligent Light System developed by Mercedes-Benz is also available in this vehicle class for the first time. Powerful bi-xenon headlamps provide five different lighting functions suited to typical driving and weather conditions: country mode, motorway mode, enhanced foglamps, the Active Light System and cornering lights. Yet another important contribution by Mercedes-Benz to safer driving in poor visibility. Interior design "cast from a single mould"
s. Silver-coloured bezels, black dial faces, white markings and glowing orange needles perfectly combine form with function for a high value impression and easy legibility. Equally clearly laid out and well-arranged, the two-tone dashboard and centre console of the new C-Class form a harmonious unit in line with the "design cast from a single mould" principle. The same applies to the integration of the colour display at the upper centre of the dashboard. This is perfectly positioned within the driver's line of vision, but can also be covered or folded away as required, without switching off the radio, navigation system or other units linked to the display. If the pivoting cover of the display aperture is closed, the infotainment units continue to operate. The central colour display is part of the new control and display concept which the new C-Class has adopted from the luxury-class Mercedes models. Its major advantage is rapid access to frequently used functions, which means that the driver does not need to relearn, is able to maintain familiar habits and feels at home immediately. All the control and display elements necessary and important during a journey are located in the cockpit, i.e. in immediate proximity to the driver. In the same way, linking the standard multifunction steering wheel with the instrument cluster is an important precondition for rapid access to a wide range of information and functions in the driver's direct line of vision. Other functions such as infotainment are shown by the display at the centre of the dashboard. The driver and front passenger are able to control the radio, navigation system or telephone by using a controller on the centre console, or access the main menus using direct selection keys. The Audio 20, Audio 50 APS and COMAND APS systems are a range of newly developed, optional infotainment units for C-Class passengers. They all feature a keypad for entering telephone numbers and radio frequencies, as well as a Bluetooth interface which wirelessly connects the mobile phone to the hands-free system. In the Audio 50 APS, the route guidance information - some of it as a visually attractive automatic junction zoom display - is shown by means of arrows on the fixed colour display (4.9-inch) in the dashboard. An integral 6-CD changer and the LINGUATRONIC voice control system are available on request. The multimedia system COMAND APS offers even more functions than before in the new C-Class. One new feature is a Europe-wide navigation system whose data are stored on a hard disc (30 gigabytes). The high-resolution maps are shown on a colour display (7-inch) which pivots away and disappears beneath a cover at the touch of a button. Other functions of COMAND APS include a music server with a four-gigabyte memory, a DVD-player for video and audio, and the LINGUATRONIC voice control system, which Mercedes-Benz has likewise improved further: the driver no longer needs to spell out the names of countries, towns or roads, but is able to speak them as whole words. The voice control system is just as convenient when selecting radio stations or entries in the telephone directory. models in the previous C-Class to customers all over the world. This makes the C-Class the bestseller in the Mercedes-Benz passenger car range. Germany is the largest market for the C-Class, accounting for around 30 percent of worldwide sales.